Economic development and a dramatic improvement in living standards in many parts of the People’s Republic of China during the past three decades of economic reforms have been hailed by the Chinese Communist Party and many commentators in the international arena as the most spectacular achievements in the history of humanity. However, three decades of economic reforms have also transformed China from one of the world’s most egalitarian societies into one of the most unequal. This book offers a comprehensive account of inequality in China from an interdisciplinary perspective. It both draws on, and speaks to, the existing body of literature that is generated mainly in the fields of economics and sociology, while extending its scope to also examine the political, social, moral and cultural dimensions of inequality. Each chapter addresses the question of inequality from a specific context of research, including housing, health care, social welfare, education, migration, land distribution, law, gender and sexuality. Moving beyond traditional socio-economic theories, the contributors to this volume explore a wide range of social, political, economic and cultural practices that result from, as well as further entrench, the inequalities in Chinese society. 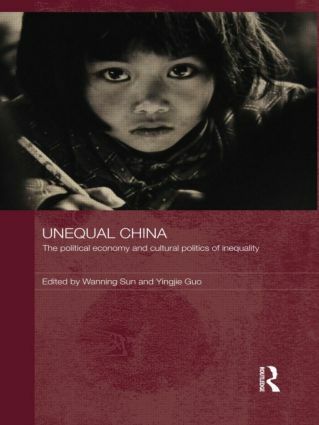 Importantly, the essays in Unequal China probe the hidden causes of inequality - namely, the role of state power and the importance of culture - and underline how both state power and cultural factors have a key part to play in legitimating inequality. With an innovative approach that moves beyond the economic and sociological roots of inequality in China, this volume is a welcome addition to what is a growing field of study, and will appeal to students and scholars interested in Chinese culture and society, Chinese politics and Asian social policy. Wanning Sun is Professor of Chinese Media and Cultural Studies in the China Research Centre at the University of Technology in Sydney, Australia. Yingjie Guo is Associate Professor in Chinese Studies at University of Technology in Sydney, Australia.